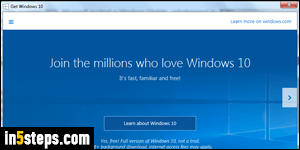 In early summer 2015, Microsoft pushed a Windows Update, unbeknownst to users until after the fact, which promotes its latest operating system. It's the "Get Windows 10" logo shown on the screenshot. 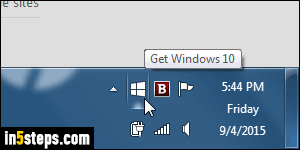 I'll show you how to hide its icon from the system tray: remember that you have one year to upgrade to Windows 10 for free. That notification is the tool you use to "reserve" your copy. 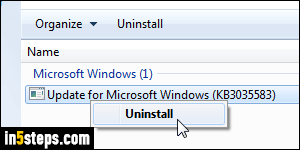 But I'll also show you how to completely uninstall that icon, should you decide to stick with Windows 7 (which is supported for security updates until 2020). This Windows 10 notification, by the way, isn't just shown to Windows 7 users: Windows 8 and Windows 8.1 users also get it. These are the three operating systems from which you can upgrade to Windows 10 for free, at least until the end of July 2016. 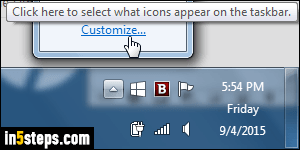 To hide the icon, click on the up arrow near the system clock, and click on the "Customize" link, as shown on the next screenshot. In the left column, locate the icon called "GWX - Get Windows 10". Click on its dropdown, and select "Hide icon and notifications" from the menu. Click OK to apply. 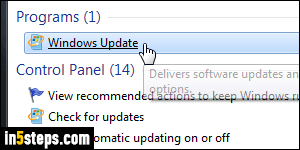 The icon will stay hidden from now on, but remains only a couple of clicks away, should you change your mind and decide to upgrade.